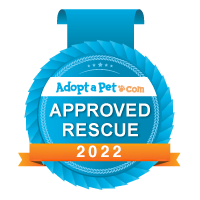 Thank you for your interest in adopting one of our rescue pets! We ask that you fill out the adoption application completely and answer the questions honestly. Once your application is received, a volunteer will email you within 48 hours. Please be sure to check your spam folder if you have not received a response within that time frame. Note: for socialization purposes, kittens younger than 6 months must be adopted with another kitten/cat or go to a home with a resident cat. Who will be responsible for the daily care and training of the pet? Will someone be home during the day? If so, who? How frequently will adults be away on trips? Where will your pet be kept when on vacation? What kind of diet do you plan to feed your pet? What brands of food do you plan to use? What made you choose this specific dog? How much time outside will the dog spend each day? What training will you do with your dog? How did you hear about this pet?